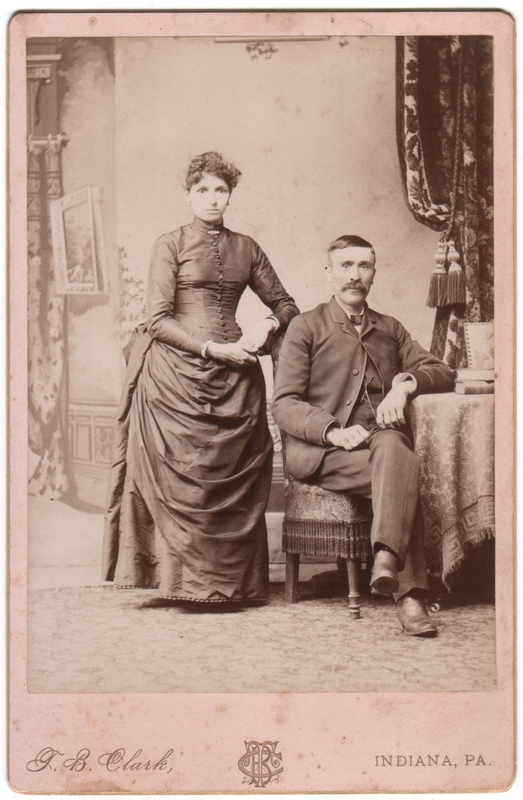 Cabinet card measuring just under 4.25 x 6.5 inches. 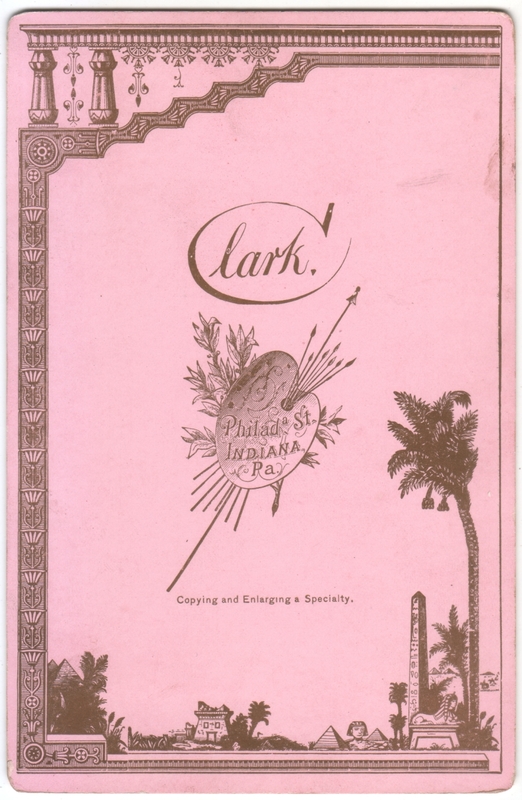 Photographer is T. B. Clark of Indiana, Pennsylvania. Otherwise undated and unidentified. Indiana, Pennsylvania, is another one of those towns that is disproportionately represented in my collection. Looking back, I see they were all purchased among the same large lot of otherwise random photos, but it still surprises me that this is my fourth post of photos from such a small town. (The only other one from the same photographer so far is this one.) By the way the back of this card is kind of interesting, with its pink color and Egyptian motif, so I posted it here. As for today’s couple, they look a little uncertain about the proceedings, but they don’t look entirely unhappy. She is very pretty in a possessed kind of way. I agree. I was thinking she had a deer-in-the-headlights look, but perhaps she could benefit from an exorcism. She’s pretty in any case. There were at least three photographers during that time in Indiana, PA. They were Clark, Smith and Tiffany. I believe all were on the same street. I’m related to Tiffany but have so many relatives from Indiana which may have used some of the other photographers as well. I’d be very interested in this particular collection that you bought. I may know of some of the people and if not, I am in contact with someone who grew up there and knew many families. Do you ever sell any of your pictures? Just curious. I love your blog and look forward to each new picture you post.